cardigans and kids: a recipe for stromboli. 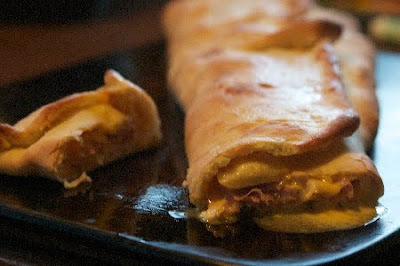 One thing I pulled back out for Autumn and I'll make through winter is stromboli. Really, all it is is meat and cheese wrapped in dough - and a perfect to go with soup this time of year. You can fill it with what ever you want, I've made them with taco meat, cheese, olives, peppers and onions to make taco stromboli, but most often, the kids like it with ham, turkey and mozzarella and cheddar. Starting a couple hours before supper time, make the dough. In a kitchen aide mixer bowl*, measure the yeast, sugar and salt into. Next add the warm water. Lastly I add the flour and using my dough hook mix the dough onto it is in a ball around the hook. Put the teaspoon of olive oil into another med. size mixing bowl, and put the dough into that bowl, flipping it over so all sides are oiled. Cover the bowl with saran wrap and leave to rise for 1 1/2 - 2 hours. After the time is up, or you are ready for some supper, preheat the oven to 405 F. Roll out the dough on a lightly floured surface. I make a large rectangle around 1/4 in. thick. You are going to roll the two longer sized up, so as you are rolling, think about the size of pan you are going to put the stromboli on. Once rolled out, I use a knife and put a thin layer of butter down the center of the dough, then add the the ham, spreading it out evenly along the center of the dough, then a layer of cheese, next turkey, followed by the rest of the cheese. Next, I carefully roll up the long sides, also bring in the ends a bit so it is closed all the way around. At this point, if I don't think the meat/cheese combo is quite even I may open it back and shift things around until the entire roll seems to be the same size. Now using a large spatula and my free hand, carefully slide the stromboli onto the pan. You can also put the dough on the pan before adding the ingredients, I just tend to forget for some reason. Place in the oven for 20-25 minutes. The top should brown nicely before you pull it out. If you do not own a kitchen aid, just knead the dough until it reaches the ball like consistency on a floured surface. I made it many times before I owned a kitchen aid and the only change I needed was to add a few more minutes to finish the kneading. looks + sounds delicious! and pretty easy too! Alison - they are easy. Once you have made them, not much to think about the next time round.